Many Floridians work tirelessly to protect sea turtles from the many threats they face on and off the nesting beach. However, a recent coastal update shows that these majestic creatures are in danger from a phenomenon mostly beyond our control: red tide. Satellite images from the Florida Fish and Wildlife Conservation Commission show a patchy area of red tide recently spotted in the northeast Gulf of Mexico. Red tide is a sudden increase in algae population, which often results in the sickness and death of marine life in the affected area. Photo courtesy of Florida Fish and Wildlife Conservation Commission. According to an article by the Associated Press, this specific algal bloom stretches 100 miles from St. Petersburg to Florida’s Big Bend, where the peninsula ends and the Panhandle begins. The affected area starts a few miles off the cost and is approximately 60 miles wide. STC is no stranger to the negative impact of red tide. Last year, STC had a rehabilitated turtle named Tampa Red participate in Tour de Turtles. Sponsored by the Tampa Bay Consortium and the Florida Aquarium, Tampa Red was injured by red tide in the Gulf of Mexico. 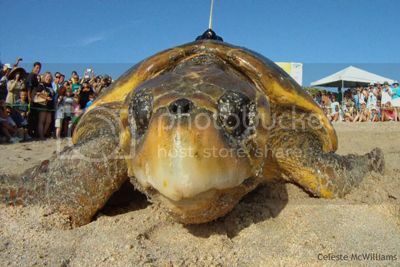 Loggerhead Melba was recently spotted in the area of the red tide bloom. STC is keeping a close watch on current Tour de Turtles competitors that have been spotted in the affected area. 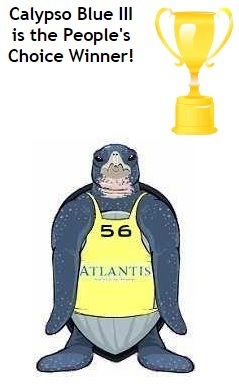 Loggerhead sea turtle Melba, now in fifth place, has been spending a lot of time off the coast of Cedar Key in the heart of the bloom. The Sea Turtle Grant Program, which is administered by STC, has helped support facilities that have taken in sea turtles impacted by red tide in the past. The program gave Mote Marine Laboratory a grant of over $22,000 to investigate sea turtles stranded by red tide in central west Florida in 2005. Results of that work showed that a neurotoxin in the algae called brevetoxin appeared to be the primary cause behind the strandings of sea turtles that washed up on beaches in the area. The red tide bloom currently spotted off the coast of Florida stretches 100 miles. Photo courtesy of CTV News. After expanding on that research, scientists now understand the effect of red tide on sea turtles and other marine wildlife is even more alarming. Mote and the Conservancy of Southwest Florida teamed up during the 2012 and 2013 red tides in and around Pine Island Sound, along Florida’s southwest Gulf coast. The research aimed to understand the effects of red tide on Kemp’s ridley sea turtles, a critically endangered species. According to an article by news-press.com, the study is the first of its kind to look at the effects of brevetoxin in living and free-swimming turtles. Blood tests were run on nine Kemp’s ridley turtles, and the results showed high levels of brevetoxin as well as a protein called alpha-globulin. Increased alpha globulin is a sign of inflammation, which means these turtles may seem healthy on the outside, but there’s something serious going on inside. Mote’s Justin Perrault, the study’s principal investigator, told news-press that Kemp’s ridley turtles are more susceptible to this toxin than other species of marine life. The toxin is absorbed and held in the tissue of filter-feeders such as tunicates, which are a staple in the diet of a Kemp’s ridley turtle. More information is needed on the impact of brevetoxin, how long it can stay in the turtle’s system and whether it can cause long-term side effects. Likewise, Perrault said the team is looking at how this toxin can affect the reproduction process and already fragile hatchlings. The turtles were also tracked via satellite during the study. Data showed that the sea turtles seemed to sense the red tide’s presence and actually avoided affected areas. Perrault said that the next step will be to determine how the turtles detect the toxin. Fish are easily affected by red tide blooms, which results in mass deaths. Photo courtesy of Florida Fish and Wildlife Conservation Commission. Red tide is negatively impacting many species of marine wildlife in Florida. According to the FWC, fish are most easily affected by red ride because their gills are directly exposed to the brevetoxin. Manatees and dolphins also feed on marine species that easily absorb the toxin, which in-turn exposes them to its harmful effects. While the causes of red tide are not clearly understood, research is being done to develop a prediction model based on ocean currents, according to the Associated Press article. University of South Florida ocean scientist Robert Weisberg is among a team of researchers working to develop a warning system, which will track the movement of nutrients that red tide needs to thrive. The article also said that the president is asking Congress for a $6 million increase for research in red tide prediction in the 2015 budget. In the meantime, you can help minimize other environmental dangers to marine wildlife by recycling plastic bags and reducing other sources of marine pollution. We depend on the health of Florida’s marine ecosystem just as the species that inhabit it do. Harming sea turtles, manatees, dolphins and fish also also impacts the overall marine environment and people that rely on these marine resources for food, recreation and other ecosystem services. If you think a sea turtle has been affected or stranded by red tide, call the FWC’s 24-hour Wildlife Alert Number at 888-404-3922. Sea Turtle Conservancy (STC) kicked off its seventh annual Tour de Turtles (TdT) with a live sea turtle release on July 27 at the Barrier Island Center, located in the heart of the Archie Carr National Wildlife Refuge in Melbourne Beach, Florida. A crowd of more than 1,000 people gathered to watch as STC researchers released two adult female loggerhead sea turtles, named ‘Shelley’ and ‘Melba,’ into the ocean to begin their migrations. ‘Shelley’ was named by her sponsors at Ripley’s Aquariums while ‘Melba‘ was named via STC’s Facebook contest. Shelley and Melba are just two of 11 sea turtles representing four different species swimming in the TdT migration marathon, an annual program that conducts valuable research and raises public awareness about sea turtles. The 2014 TdT included live turtle releases in Panama, Costa Rica, Nevis and Florida. The final release is on August 15 at Sombrero Beach, Fla. This year is the first time that a rehabilitated loggerhead turtle is competing in the TdT. ‘Pine Tyme‘, an 80 pound sub-adult loggerhead, was spotted struggling on the surface unable to dive and is now being treated at The Turtle Hospital in Marathon, Florida. Upon recovery, Pine Tyme will be equipped with a satellite transmitter and released from Sombrero Beach, Fla. on August 15 at 1:00 p.m. This is also is STC’s first ever release in the Keys. 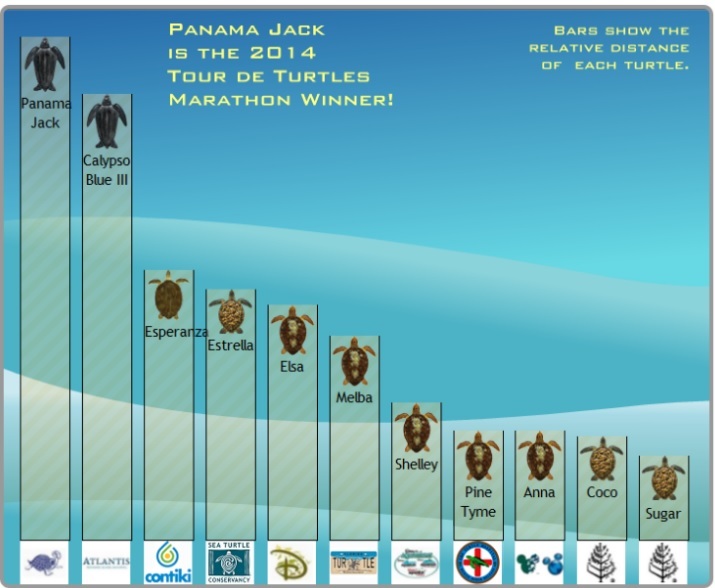 Results from the 2013 Tour de Turtles. Who will win this year’s race?? ‘Esperanza’, a green sea turtle sponsored by Contiki and the TreadRight Foundation, is swimming to raise awareness about the threat of egg harvesting for consumption. After she laid her eggs on July 3, 2014, it was discovered that her nest had been poached and her eggs stolen! Luckily, the local police were able to catch the poacher and return the eggs to STC’s team, who quickly and carefully reburied them in a new location. Hopefully we’ll see some green hatchlings erupting from Esperanza’s nest in September! ‘Sugar’, a hawksbill sponsored by Four Seasons Resort Nevis, already had flipper tags when STC found her nesting on Lovers Beach, Nevis. After looking up her tag number, STC was able to determine that she was first tagged by the Nevis Turtle Group in 2007. This was great news because it provided further evidence that sea turtles return to the same beach to nest. ‘Melba’, a loggerhead sponsored by the Sea Turtle Grants Program, ranks in the top five largest loggerheads STC has ever released! She also has one of the biggest heads, which is fitting as loggerheads get their name from their exceptionally large heads. For a full list of turtle competitors and sponsors, visit the official website at www.tourdeturtles.org or head back to the blog tomorrow to meet all the turtles! Sea Turtle Conservancy (STC) is proud to announce its 9th consecutive top rating from Charity Navigator, the leading evaluator of non-profit groups in the United States. STC once again received 4 out of 4 stars, indicating that our organization adheres to good governance and other practices that minimize the chance of unethical activities and consistently executes our mission in a fiscally responsible way. STC spends 85 cents of every dollar donated directly on research, conservation and education programs. STC’s commitment to transparency, good governance and fiscal responsibility ensures that donations are used in an efficient manner to support conservation programs. STC’s rating and other information about charitable giving are available free of charge on Charity Navigator. The last large populations of the leatherback turtle are at risk because their migratory routes in the Atlantic Ocean converge with the locations of industrial fisheries, a new study shows. Sea Turtle Conservancy (STC) is one of ten organizations that worked together to publish the study which provides insight into the complex patterns of movement by leatherback turtles in the Atlantic and their overlap and accidental capture by industrial longline fisheries for pelagic (open ocean) species such as tuna and swordfish. Between 1995 and 2010, a total of 106 leatherback females from populations throughout the Atlantic were equipped with satellite tags and tracked over extended periods of time. Satellite tracking data revealed that leatherbacks display complex patterns of movement in national coastal and international waters and use the waters of 46 of the 97 countries bordering the Atlantic. By overlaying the turtles’ tracks with information on fishing effort, researchers were able to identify nine areas where high risk of capture by fisheries exists, four in the North Atlantic and five in the South Atlantic. Sea Turtle Conservancy’s Technology and Research Specialist Dan Evans is a co-author on the report. Maps of the daily locations of the turtles revealed that Atlantic leatherbacks use both deep sea international waters (more than 200 nautical miles from land) and coastal national waters, either seasonally or year-round, in a complex pattern of habitat use. About 16,600 female leatherbacks breed in the Atlantic each year, and while some populations are doing well, accidental capture in longline and other fisheries remains an important conservation threat because fishing effort is intense. More than 4 billion hooks – equivalent to 730,000 hooks per day – were set throughout the entire Atlantic Ocean by industrial fisheries between 1995 and 2010, the study shows. The study results from the collaborative efforts of 10 data providers that have tracked leatherback turtles in the Atlantic Ocean since 1995 through the Trans-Atlantic Leatherback Conservation Initiative (TALCIN). The article, ‘Pan-Atlantic analysis of the overlap of a highly migratory species, the leatherback turtle, with pelagic longline fisheries,’ is published in Proceedings of the Royal Society B. Other contributing authors on this report include: S. Fossette, Department of Biosciences at Swansea University; M.J. Witt, Environment and Sustainability Institute, University of Exeter; A.C. Broderick, Center for Ecology and Conservation, University of Exeter; P. Miller, Center for Investigation and Marine Conservation, Uruguay; M.A. Nalovic, Virginia Institute of Marine Science; D. Albareda, Aquamarina, Del Besugo 1525, Pinamar, Buenos Aires 7167, Argentina, Jardín Zoológico de la Ciudad de Buenos Aires, Republica de la India 3000,Buenos Aires 1425, Argentina, and Regional Program for Sea Turtles Research and Conservation of Argentina; A.P. Almeida, ICMBio–Reserva Biológica de Comboios, Linhares, Brazil; D. Chacon-Chaverri, Asociación LAST, Apdo 496-1100, Tibás, Costa Rica; M. S. Coyne, SEATURTLE.org, Durham, NC; A. Domingo, Dirección Nacional de Recursos Acuáticos, Constituyente 1497, Uruguay; S. Eckert, WIDECAST and Biology and Natural Resources Department, Principia College; A. Fallabrino, Karumbé – Av. Rivera 3245 (Zoo Villa Dolores), Uruguay; S. Ferraroli, Rue Victor Hugo, France; A. Formia, Wildlife Conservation Society; B. Giffoni, Fundação Pró-TAMAR, Rio Vermelho, Salvador, Bahia, Brazil; G. C. Hays, Department of Biosciences at Swansea University, Center for Integrative Ecology, Deakin University; G. Hughes, 183 Amber Valley, P/Bag X30, Howick 3290, South Africa; L. Kelle, WWF, French Guiana; A. Leslie, WWF International, Switzerland; M. Lopez-Mendilaharsu, Karumbé – Av. Rivera 3245 (Zoo Villa Dolores), Uruguay and Fundação Pró-TAMAR, Rio Vermelho, Salvador, Bahia, Brazil; P. Luschi, Department of Biology, University of Pisa in Italy; L. Prosdocimi, Regional Program for Sea Turtles Research and Conservation of Argentina and Laboratorio Genética de la Estructura Poblacional, Departamento de Ecología, Genética y Evolución, FCEN, Universidad de Buenos Aires, Capital Federal, Buenos Aires, Argentina; S. Rodriguez-Heredia, Regional Program for Sea Turtles Research and Conservation in Argentina and Fundación Mundo Marino, Buenos Aires, Argentina; A. Turny, WWF French Guina; S. Verhage, WWF Gabon; B.J. Godley, Center for Ecology and Conservation University of Exeter. Sea Turtle Conservancy is currently accepting applications for sea turtle research assistants in Tortuguero, Costa Rica. Research and monitoring of sea turtles in Tortuguero was initiated in the 1950’s by legendary sea turtle researcher Dr. Archie Carr. Dr. Carr continued his work in Tortuguero until his passing in 1987 and STC continues to conduct annual programs at the site, making it the longest ongoing sea turtle conservation and monitoring program in the world. Between eight and sixteen Research Assistants (RAs) will be trained in sea turtle monitoring techniques by, and work under the supervision of, the STC Field Research Coordinator. The RAs main responsibilities include nightly tagging, track surveys, nest monitoring and excavation. RAs are responsible for tagging nesting turtles, collecting biometric data from females, recording nesting activity during track surveys, and other pertinent data collection. RA positions are voluntary and selected RAs will receive board and lodging at the STC Field Station for the duration of their time working for STC in Tortuguero. “When I took the position here as the Field Research Coordinator in Tortuguero, Costa Rica I knew fully what I was getting into. Having spent three months here as a Research Assistant for half of the green turtle season in 2010, I was well aware of the wild adventure and surprise that Tortuguero would provide. When most people hear I am working on a Caribbean beach in Costa Rica they envision a white sand beach where luxurious tiki style huts hang over crystal clear water. But, here it is far more rustic and wild. Imagine Jungle Book meets Indiana Jones. In reality, Tortuguero is a highly dynamic beach who’s landscape changes as fast as the tide. The beach is backed by a lush, dense jungle that is supported by the migration of sea turtles. Under the clearest of Milky Way skies, we set out to patrol the beach nightly in search of three to four hundred pound nesting female turtles. We do so to collect data and monitor their epic population rebound of 500% here in Tortuguero. Then as quickly as the turtles appear they vanish on their return to far off feeding ground around the Caribbean. To view more spectacular sea turtle photos by Ralph, check out his Facebook page RALFotos. For more information about STC’s Research Assistant positions including a project summary and work description, click here. The deadline to apply for the Leatherback Research Program is January 7, 2014 and the Green Turtle Program deadline is March 10, 2014. For questions pertaining to STC’s Research Assistant Program, please contact STC Scientific Director Emma Harrison at emma@conserveturtles.org. Sea Turtle Conservancy (STC) has received three grants awarded by Florida’s Sea Turtle Grants Program to support sea turtle-friendly lighting education and loggerhead migratory research. Two of the grants focus on educating coastal residents in Florida about the impacts of beachfront lights to nesting females and sea turtle hatchlings and offering options for converting existing lights to amber LED fixtures that minimize impacts to sea turtles. Artificial lights are a major threat to nesting sea turtles and hatchlings because 78% of Florida’s housing is located in coastal communities. These grants will help STC educate the public on the importance of making sure beachfront homes have the right type of lights to ensure safety for people and sea turtles. The third grant is studying the migratory routes and foraging grounds used by loggerhead turtles from the Archie Carr Refuge in Melbourne Beach. The goal is to reveal important information about the turtles’ migratory behavior, foraging grounds, and the areas of potential conflict with commercial fisheries or legal harvest of sea turtles. Currently, there are four turtles being tracked in this research study. Two turtles went to areas that STC had not observed before in the waters off Florida’s Panhandle and to the Yucatan Peninsula. These grants are supporting critical programs that are increasing knowledge about sea turtles and providing solutions to ensure their survival. The grants were made possible by the sale of the “Helping Sea Turtles Survive” specialty license plate, which funds Florida’s Marine Turtle Protection Program and the Sea Turtle Grants Program. 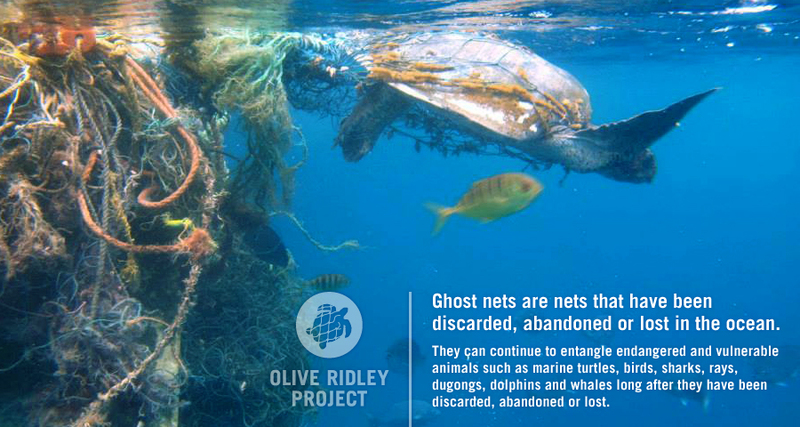 To learn more, visit www.helpingseaturtles.org. Today’s blog post about working with sea turtles in Costa Rica is by Brian Drozd, a program officer at the U.S. Department of State. He has over 6 years of experience working for the United States Environmental Protection Agency, where he worked on grants and communications in the Climate Change Division. His Master’s degree in Natural Resources and Sustainable Development enabled him to focus on sustainable tourism and conservation. In the summer of 2009 I spent 10 weeks working with sea turtles on the rugged coast of Tortuguero, Costa Rica. Working as a research assistant for the Sea Turtle Conservancy, I spent my time walking up and down a 5 mile stretch of beach in the middle of the night looking for green sea turtles to measure, tag, and count the number of eggs they laid. I did this only for meals and a roof over my head. Why would someone do this? Sea turtles have swum in the world’s oceans for 100 million years, and they are in danger of extinction. Threats from poaching, commercial fishing, and climate change, among others, are threatening these animals all over the world. Many people say healthy sea turtles mean healthy oceans. They only lay eggs every 3-4 years, and generally come back to nest on the same beach where they were born throughout their life. One turtle we found had nested on the same beach in 1982! They only lay their eggs at night, after digging a hole that can be up to 5 feet deep. They only come on land to lay their eggs. There are only an estimated 88,000 nesting green turtle females in the world. The goal of my time in Tortuguero was to help the Sea Turtle Conservancy collect data to monitor the health and numbers of the sea turtle population. We also worked closely with the local people to educate them about sea turtles and help them conduct their eco-tourism business with the turtles in a safe manner. One of the most amazing experiences as a research assistant was when we put a satellite transmitter onto a green turtle. Using a transmitter to monitor turtles we are able to learn about their feeding patterns, how long they stay under water, and much more. It is just this kind of valuable information that is helping scientists learn how to better help protect these animals. Sea Turtles nest all over the world. Large nesting populations are found in many countries in Latin America and Africa, as well as in India, Indonesia, and China. All sea turtles are in need of protection, monitoring, and research in order to make sure they survive for future generations. There are many actions you can take to help sea turtles near your home and around the world. Some of them are: reducing pollution, not eating sea turtle meat or eggs, and protecting coastlines by slowing development and reducing light on nesting beaches. View more tips here and research just a few of the many organizations working to save turtles around the world. I had an incredible time working with sea turtles, and I’m sure you would too! Each nesting season, STC invites students and recent college graduates to assist with research at Tortuguero in Costa Rica. 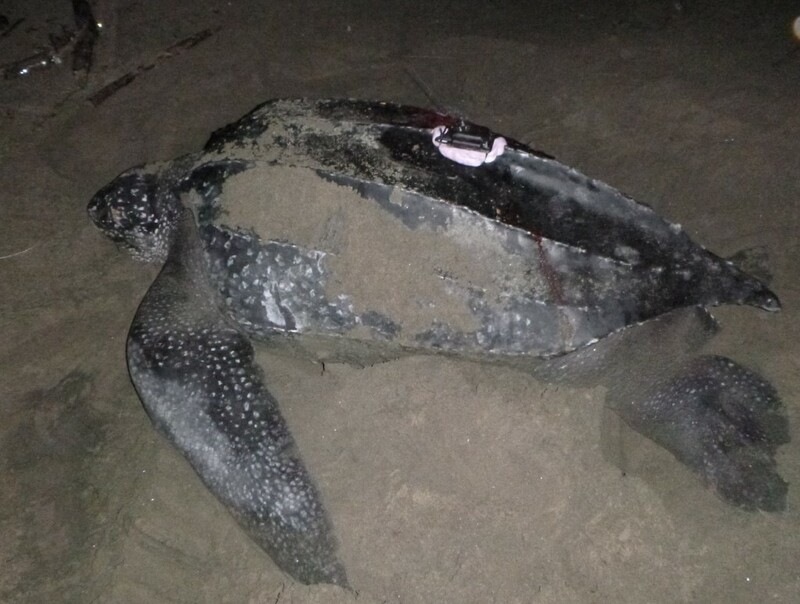 During this year’s leatherback nesting season, research assistant Maddie will be sharing her experience with STC’s members and supporters. “¡Hola! Mi nombre es Madeleine Beange. I grew up in beautiful Vancouver, Canada. In 2009, I completed a B.S in neurobiology at McGill University. After a year of neuroscience research I got sick of killing mice. I left my lab job to backpack Southeast Asia for a couple months. After a taste of wandering the world, I realized I needed more. Pursuing my dreams of working with sea turtles, I worked for 9 months and saved up enough money to fly to Costa Rica. My fist experience with sea turtle conservation research was with PRETOMA, a Costa Rican NGO. From October to December 2011, I worked as a coordinator/research assistant for 3 months. To read about Maddie’s adventures as a Sea Turtle Conservancy research assistant, click here for her blog, Mad About Sea Turtles. I recently was invited to join a team of veterinarians and biologists working for NOAA and the BP oil spill Unified Command on a trip into the Gulf of Mexico to document and rescue sea turtles impacted by oil. The trip also gave me an opportunity to observe first-hand the current status of ocean-surface conditions and the availability of suitable sea turtle habitat in that region of the Gulf. The 12-hour voyage departed from Venice, Louisiana, a small fishing community located at the southernmost point of land where the Mississippi River spills into the Gulf. Joining me on the trip were Dr. Brian Stacy, a NOAA veterinarian based at the University of Florida who has been coordinating sea turtle rescue efforts in the waters south of New Orleans and Dr. Joe Flanagan (a vet from the Houston Zoo). Also participating was Jonathan Gorham of In-water Research Group and representatives from two other conservation organizations (Chris Pincetich of the Sea Turtle Restoration Project and John Hammond with the National Wildlife Federation). Our primary task was to locate and rescue any sea turtles that might have been impacted by the oil spill. Rescue efforts such as this have been underway since shortly after the spill began, and they continue out of several port cities around the Gulf. Since the start of the disaster at the end of April, nearly 1,000 sea turtles have either stranded on Gulf Coast shores or have been recovered at sea through rescue efforts such as this. Our trip took us about 50 miles into the Gulf, where we began to spot mats of floating sargassum weed-an important pelagic habitat for both juvenile and hatchling sea turtles. Aside from tiny pieces of plastic and other types of common marine debris mixed in with the sargassum, the habitat we encountered appeared quite healthy. In fact, the mats were teaming with fish and other important marine species such as small shrimp, crabs and other vertebrates and invertebrates that sea turtles feed upon. Over the course of the day we also spotted and recovered two juvenile Kemp’s ridleys that showed no sign of having come in contact with oil. Considering that this very region of the Gulf was once thickly coated with oil, it seems most likely to me that the sargassum we encountered had drifted into the area, likely from the west, where it never came in contact with oil. Since the beginning of the spill, large amounts of oil-soaked sargassum have been corralled and burned by BP and its contractors. An undetermined amount of oil-soaked sargassum also has died and sunk below the surface by now. In this way, a substantial amount of important turtle habitat has been eliminated from the Gulf. However, this trip gave me great hope that sea turtles and their sargassum habitat are moving back into the region, but full recovery will take significantly longer. My most striking memory from the trip is the complete absence of oil on the surface, despite our close proximity to the Deepwater Horizon oil spill site. On one hand I found it encouraging that the habitat, at least on the surface, appeared healthy. Unfortunately, conditions on the surface don’t tell the entire story about how oil and chemicals used to disburse the spill continue to impact the wildlife and ecology of the Gulf of Mexico. For government and non-government biologists alike, this remains a major concern, and research on what is happening below the surface needs to continue. Based on my observations on this day and in this location, the surface habitat for sea turtles appears to be recovering a lot faster than most people, including me, thought would be possible. NOAA and other personnel responding to oil-impacted sea turtles are suggesting that their efforts to recover turtles at sea will soon wind down. While in hindsight it would have been better if more boats and rescue personnel had been in place to rescue turtles at the height of the spill, I can’t find fault with agency plans to scale back now. In fact, at this point chasing little Kemp’s ridleys out of healthy habitat seems more intrusive than helpful. Other threats to sea turtles, and especially the risk posed by the reopening of shrimp trawling in Louisiana waters, where state law does not require shrimpers to use Turtle Excluder Devices, presents a more significant survival threat to both loggerheads and Kemp’s ridleys. As efforts to rescue oil-impacted sea turtles wind down, state and federal regulators need to focus on bringing Louisiana commercial fishing regulations into the 21st century, where the harvesting of shrimp is done in ways that safeguard sea turtles and other common bycatch.